Happy Friday! I really can't believe that we're nearly 10 days into September already, because I feel like it was just New Years!! This year has been flying by at lightning speed and before you know it, it will be Christmas. I'm still just trying to get my new home- can I still say new if I've been in for 3 months?! ?- put together. By the time I get everything where I want it, I will have to take everything down to hang all the holiday decorations! Oh, first world problems at their finest, am I right? Anyway, one of the spaces I really wanted to get done was the foyer or entryway. In this house, it's quite a large, unusable space. I really wanted to have a warm, welcoming vibe while using all the wall space that's in that room. I've always wanted to display all my many travel photos from over the years. They are some of my favorite pics and transport me back to the destination when I see them. So it was kind of a no-brainer to have a giant gallery wall in that space. This picture wall was not so easy to execute. Looking back, I think I was a bit over my head when I thought I could just hang these pictures perfectly. Let's just say, there was a lot of drawing on the wall, measuring and maybe even some tape! It took me three hours from start to finish to get it perfect -and it's still not perfect but there is no way I'm taking those bad boys down and starting again- and admire my work. Overall though, I'm pretty happy with how the whole space turned out and will say that at this point in my home decorating process, this is my fav room to just sit in. What about you, do you have a foyer to decorate? How do you style such an unusable space?? Totally copying this!! I love it!! That gallery wall is beautiful! How fortunate that you have so many amazing photos to display. Love it! The space is so stunning, too. So much gorgeous natural light. I totally hear you-- I can't believe it's SEPTEMBER!! WHERE HAS 2016 GONE?! Love this idea! And your pics are gorgeous captures of your travels! I love this! My husband and I have so many pictures of our travels when we were younger and since we've been together and I haven't been able to figure out how to frame them. Bulky frames get expensive after a while lol! I also think this with our travel map that we've framed is great for motivation and inspiration. Thank you for sharing this! What a great way to decorate a large area! I love the way it came out! 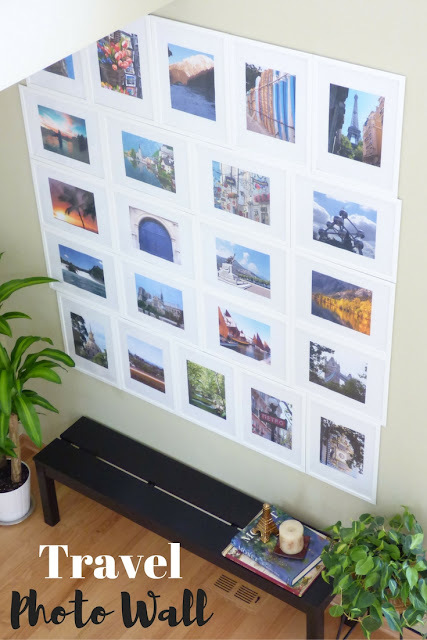 This is a fun and beautiful way to display travel photos. I do something similar with our family pics. I like the white frames and borders. I may need to update my wall, they'er all black frames. Thanks for sharing. Being a travel writer I am overwhelmed with all of the images we have captured. This is a great way to display them. Thanks for the inspiration.